These Stepless™ single piece, wide style ramps, are made from aluminium offering superb strength, whilst being lightweight to provide portability. The wide style of suitcase ramps enables easy use with wheelchairs, powerchairs and scooters with simple alignment as you approach the ramp. Attendants pushing a wheelchair up the ramp will find the wide style easier to negotiate as they can walk on the ramp itself. 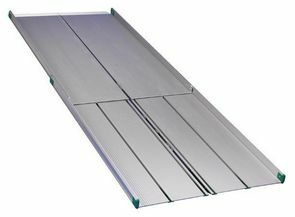 These telescopic options provide the added advantage of being able to store the ramp at a shorter length. Maximum load 325kg up to 2.4m, and 3m is 200kg. For full details download the Technical Specifications PDF. For shorter length options., please see plain length suitcase ramps ranging from 0.9m to 1.8m.